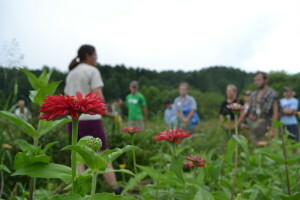 In August, CRAFT met for a great tour on cut flower production led by Vanessa Campbell and Alex Brown at Full Sun Farm. 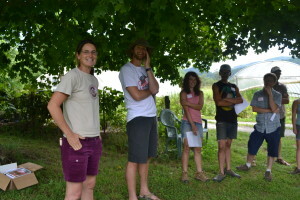 We are lucky to have these long-time CRAFT members willing to share their growing prowess and welcome us on their farm. 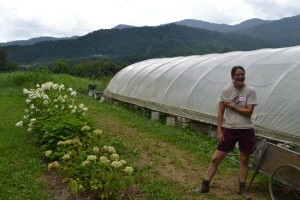 Vanessa and Alex have been farming in Leicester, NC since 1997 after attending UC Santa Cruz’s apprenticeship program in ecological horticulture. In 2011, they started their annual fruit and vegetable CSA with 24 members, which has now grown to between 50-60 members each year. This year they’ve expanded to include “market shares” where people pay up-front at the beginning of the season and then essentially have credit to spend at market each week and also receive a 10% discount. Their cut flower production had simple beginnings. After harvesting vegetables, then they’d cut the flowers, make bouquets and sell them. Cut flowers gave Vanessa and Alex a way to maintain diversity in their fields and have a little something extra on the table at market. Then, after a few years Vanessa wanted to cut back, but that season they sold more than ever, reinvigorating their zeal for growing flowers. The majority of their flowers are started from seed in the greenhouse, except for a few they start as flower plugs or bulbs. Once the first set of true leaves comes out the little flower plants are stepped up to Winstrip transplant trays, then when they grow to plantable size they are hardened off and planted. Their soil and field preparations are pretty minimal for flowers other than their basic soil mix they do not fertilize or amend the soil when starting seeds or transplanting in the beds. Although they do cultivate the raised beds the same as they would for planting vegetables. When planting they will fit 3-4 rows in each bed so that the flowers grow more densely and grow up for longer straight stems. Vanessa pointed out that with flowers you must be ruthless and “cut long to grow long.” When harvesting flowers you want long stems, and then you strip off all foliage including leaves and new buds, and place directly in buckets of water. Later a Full Sun crew member will spend several hours arranging bouquets to be sold at the farmers market. Vanessa and Alex have a variety of different considerations when choosing what variety of flowers to grow. Since they harvest the day before market they need somewhat hardy flowers that will hold up for several days once harvested. It’s also important to think about the structure of flower arranging and include a variety of focal flowers such as dahlias and zinnias, and filler flowers like sweet annie or scented basil that will be blooming throughout the season and create full attractive bouquets. Other elements to consider are texture and color adding different flowers that are airy or bulky, and having a variety of color combinations that complement each other. When planning Vanessa and Alex also plant successions of some flowers like sunflowers and calla lilies, and try to maintain a balance between slower cut and come again types of flowers with those that come up all at once for a single harvest period. Finally, they have moved toward more pollen-less varieties to reduce mess. Vanessa explained that her favorite flower tool is a pair of clippers they special ordered from Japan called okasuni 306. They are lightweight, clip stems easily, and your hand doesn’t get tired. 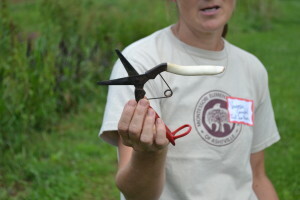 But, she does warn they aren’t strong enough to prune woodier plants like blueberries. After harvest, the bouquets are arranged and stored in a refrigerated cooler at about 40°F ready and waiting to be taken to market the next day. Later in the season, the flowers are kept in a cooler separate from the vegetables, because some veggies give off gases that can make the flowers wilt more quickly. At Full Sun the flowers are marketed as an individual CSA share or as an add-on to a vegetable share. They also sell bulk orders for weddings and events as well as allow people to come and “cut your own” flowers sold by the bucket. Vanessa reported that about ⅓ of their CSA members have a flower share, and flower sales account for about 15% of their overall sales. While they do entail a lot more harvest labor, they require less regular work balancing out the demands on the farm crew. After the tour we gathered for a lovely potluck! Thank you so much to Full Sun Farm for hosting a great CRAFT tour once again. It was great to see the diversity of organic growing and how cut flowers can fit in with annual vegetable and fruit production. CRAFT is a year-round farmer training collaborative that offers farmers and their interns networking and learning opportunities. Membership is rolling, so join anytime! For more information or to join, click here. 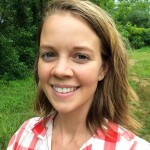 Or contact Cameron Farlow, Organic Growers School Farmer Programs Assistant at 828.338.9465 or cameron@organicgrowersschool.org.